Replacing metal features in commercial spaces is a time-consuming affair. The area is often down or being disrupted by workers for up to a week or more. Metal Shield for metal restoration in Salt Lake City commercial spaces takes only 1 day. The cost of refinishing metal features in Salt Lake City commercial spaces is very high. This is because the graffiti often has to be sanded off and the entire panel or panels replaced. This cost can get up into the tens of thousands of dollar range for something like elevator graffiti removal. 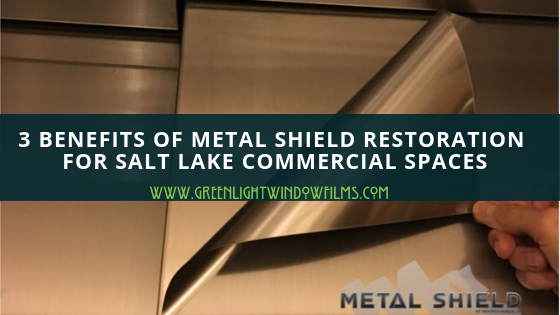 If you need metal restoration on your Salt Lake City commercial investment, contact us at Greenlight Window Films for an estimate on the cost of Metal Shield surface film today! Elevator and metal restoration with Graffiti Shield from Kansas City Green Window Film on Vimeo.